Parents who believe in "spare the rod, spoil the child" might be setting their children up to become violent toward future partners, according to a study published Tuesday in the Journal of Pediatrics. "We asked 758 kids between 19 and 20 years old how often they had been spanked, slapped or struck with an object as form of punishment when they were younger," said the study's lead author, Jeff Temple, an associate professor at the University of Texas Medical Branch. "Kids who said they had experienced corporal punishment were more likely to have recently committed dating violence." "One of the advantages of our study was to control for child abuse, which we defined as being hit with a belt or board, left with bruises that were noticeable or going to the doctor or hospital," said Temple, who specializes in dating violence research. "Regardless of whether someone experienced child abuse or not, spanking alone was predictive of dating violence." "This study confirms and extends previous research that says children who experience violence at home, even if it is couched as for their own good, end up using violence later in their lives," said Sege, who was not involved in the new research. "For children, their parents are the most important people in the world, and they learn from them what are social norms and how people should behave toward each other," he added. "Corporal punishment confuses the boundaries between love and violence for children while they are learning how to treat others." Boston University Associate Professor Emily Rothman, an expert in dating and partner violence, agreed: "The experience of having someone direct aggression to you increases the likelihood that you'll fall back on aggression when in a flight or fight moment. Having been hit by the parent can elevate stress and reduces a child's coping skills, so they may lash out." The UN Committee on the Rights of the Child defines corporal punishment as "any punishment in which physical force is used and intended to cause some degree of pain or discomfort, however light." Though spanking or slapping is most common, the committee also identifies behavior such as "kicking, shaking or throwing children, scratching, pinching, biting, pulling hair or boxing ears, forcing children to stay in uncomfortable positions, burning, scalding or forced ingestion" (such as washing a child's mouth out with soap) as forms of corporal punishment. Calling any form "invariably degrading," the committee's Global Initiative has persuaded 53 countries since 2001 to pass laws banning corporal punishment, even in the privacy of a home. The agency says another 56 countries are working to pass similar laws. However, it's legal in the United States for parents to physically punish their children at home, and most think that's exactly as it should be. 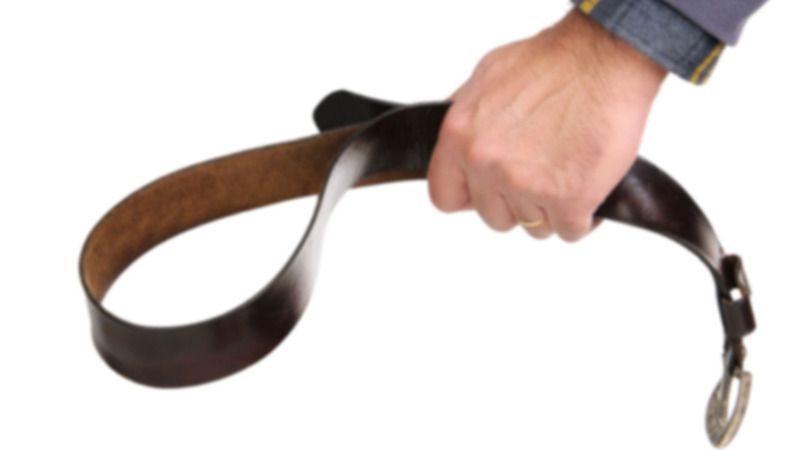 Since 1986, the University of Chicago has been asking Americans the following question in its annual General Social Survey: "Do you strongly agree, agree, disagree or strongly disagree that it is sometimes necessary to discipline a child with a good, hard spanking?" The latest data, through 2016, show that 73.6% strongly agree or agree with that sentiment. "It's been a controversial issue for several decades, with some parts of the country, like the South, using corporal punishment more than others," Rothman said, adding that religious fundamentalists are also more likely to believe in corporal punishment. "They don't think of it as violence. It's a parenting strategy." "There's a tendency for adults who have been spanked to say 'I turned out just fine,' " Temple said. "So they continue the behavior with their children." Temple and Sege argue that attitude is shortsighted and doesn't take into account two decades of research showing no benefit from corporal punishment. "There's zero evidence that it enhances children's development, and there is a whole bunch of evidence that it has negative outcomes," Temple said. "Our goal is not to turn out fine. Our goal is to turn out healthier and happier than previous generations." Sege agreed: "We didn't have seat belts for children when I was growing up, either. Research changed that. The effects of corporal punishment are quite well established to be poor." "I think that like any disciplinary tactic, its effect is in the context of how it's used," Oklahoma State University Professor Robert Larzelere said. "Research is strongest for the use of spanking between the ages of 2 and 6, when milder types of correction have failed." Larzelere co-authored a position paper on spanking research for the the American College of Pediatricians, a small group of physicians who have a conservative stance on many parenting matters. Some of its position papers state, for example, that homosexual parenting is harmful to children, gender dysphoria in children will be outgrown by adolescence and cohabitation before marriage will negatively impact any children born before, during or after cohabitation. Larzelere and his co-author, Dr. Den Trumbull, concluded that "it's okay for parents to spank," but with some conditions: Parents should ensure children know it's "motivated by love and concern for their well-being" and be certain "they do not use disciplinary spanking too severely." Spanking should always be used in a manner that reduces the need to use it in the future, the paper said. To bolster their viewpoint, Larzelere and Trumbull point to "serious limitations" in recent research: Studies often rely on a person's recall of childhood punishment, fail to separate spanking from other types of corporal punishment that might be more severe and draw what they consider to be overblown correlations with faulty logic. "People who move to Florida are more likely to have Alzheimer's," for example, Larzelere said. "And it's not because Florida causes Alzheimer's." "People say there is a debate about spanking. The debate is not in the data. The data is very consistent," said Elizabeth Gershoff, associate professor of human development and family sciences at the University of Texas at Austin. During their investigations, Gershoff and Grogan-Kaylor also looked for evidence that supported people in the United States -- and researchers -- who think spanking is good for kids. "We thought maybe we would find that in some studies, but we did not," Gershoff said. "These results provide strong support for consideration of spanking as an (adverse childhood event)," the study authors wrote. Adverse childhood events include sexual and physical abuse and neglect, substance abuse, mental illness and partner violence within the home. The US Centers for Disease Control and Prevention calls adverse childhood events "an important public health issue" due to their strong relationship to numerous health, social and behavioral problems throughout a person's life, including substance use disorders; smoking; heart, lung and liver disease; and poor work performance. "Once or twice is almost surely no big deal, and the real problem is the parents who are doing it a lot. ... It's really the parents who are using it regularly and intentionally as a form of discipline," said George Holden, professor and chairman of the Department of Psychology at Southern Methodist University in Dallas. Getting spanked just that one time may not affect a child's relationship with their parents, but it may still be remembered and resented, Holden added. Gershoff agrees that the odd spanking would probably not have long-term effects but asks "why do it at all?" if no studies have found positive effects. There is some evidence that the support for spanking in the United States is slowly fading. In the 1980s, 82% of women and 84% of men agreed with spanking as a necessary form of discipline. According to a 2014 survey, that number had dropped to 65% of women and 76% of men agreeing that children sometimes need a "good hard spanking." If spanking doesn't work, what does? Sege says the techniques depend on the child's age. "During the first year what infants need to learn is love," he said, "while they discover their new abilities such as crying and making messes. So parents should distract, by giving them other things to do that are less disruptive or picking them up and moving them to a different place. That's all they can do." As kids grow to toddlers and persist in doing things you don't want, he said, the best technique to to tap into their need for attention. "Toddler's crave their parent's attention, so use that to your advantage," Sege said. "Pay attention to the things your children do that are wonderful; reward them for those with praise. Then when they do something you don't like, put them in time-out and take the attention away. Use that. That's how time-outs work." "So instead of shielding, help them learn the lesson, as long as they are not in danger," Sege said. "Things like 'you didn't put your toys away, so instead of playing, you have to clean them up before we can play.' It takes parents out of the loop." "And you do that by calling them out on their behavior and its consequences and then help them figure out how to resolve those consequences. "It's hard, because it requires, at least at first, a level of mindfulness and thought on what you are doing as a parent," Sege said. "Parenting isn't easy. The good thing is that our children excuse us for the mistakes we make."